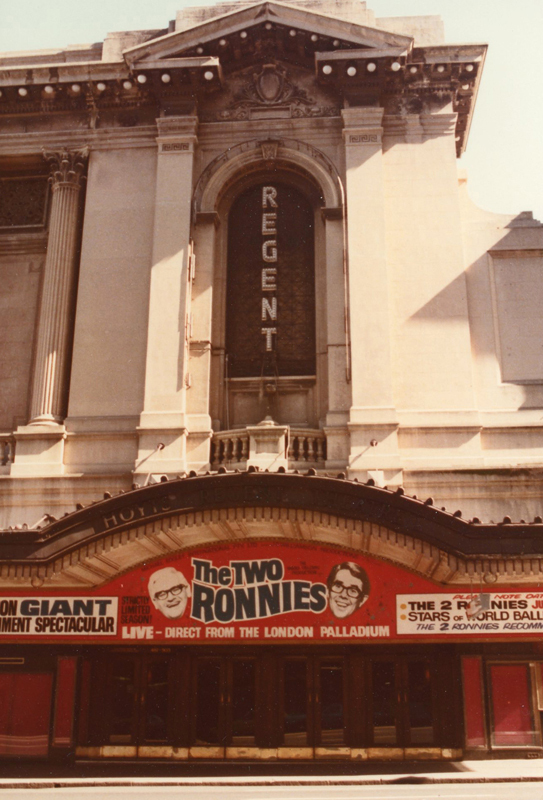 The colossal London’s Palladium success, the Two Ronnies show, is now in Sydney, at the Regent Theater before Melbourne. 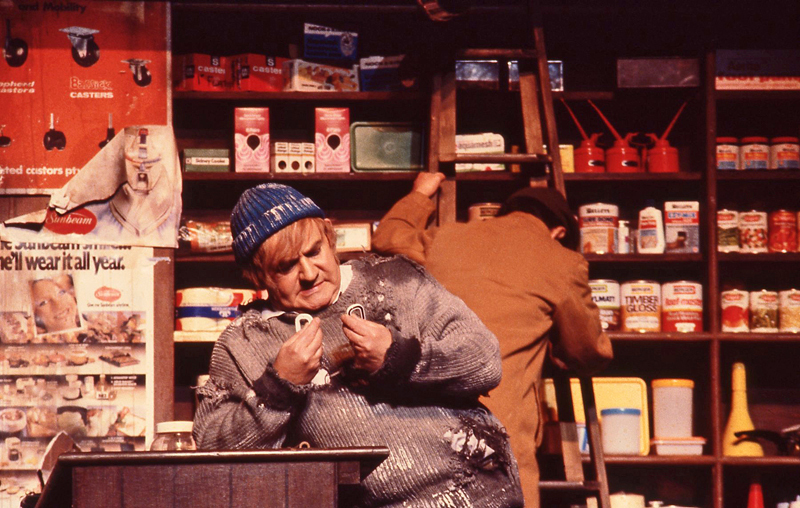 Ronnie Barker and Ronnie Corbett are as famous, through the television in Australia as they are in the UK. 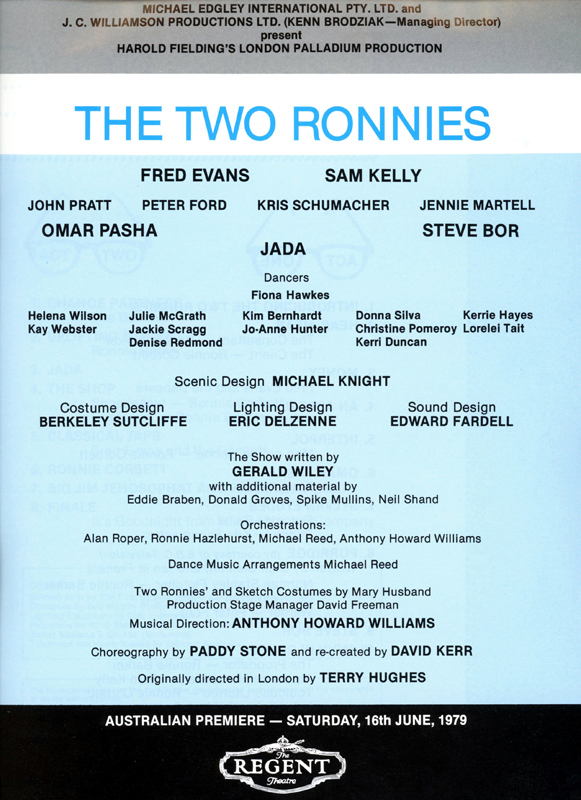 The show is the same big one as in London and Bristol (1978) – and in other big cities in the UK – in the Harold Fielding’s production, co-produced in Australia with Michael Edgley. The show is a huge success. The foreign artist’s working permits are very hard to obtain. There are only 5 from the original production, added to the two stars : an actor, the ballet captain, the principal dancer who is Australian and the 2 of us. The rest of the cast and the other acts are booked in Australia. We have kept a copy of the English producer’s letter explaining to the Australian authorities, that he is “obliged” to book us. Thank you, dear Harold for this and for having offered the plane ticket to our son Louis-Olivier. He had already been wonderfully adopted by everybody in London and Bristol. He is 14 years old and has recently started to study through correspondence. For the 3 of us, the discovery of this country / continent is a great adventure. It is also the beginning of an affection and fondness for Australia. Dozens of years and 4 journeys and contracts later, it has never changed. We have always felt adopted and we never had the impression of being foreigners. We have made friends, that we have kept for nearly 40 years. We have a mild winter, the beautiful and numerous bays are delicately rimmed, we discover the surfers at Bondi Beach. The Sydney Opera House architecture is visible from far away, as well as downtown with its towers. Residential areas display villas with their own swimming pools, the former harbour docks are transformed into cafes, galleries and other up-to-date places. About the fashionable Double Bay area it is said : Double Bay, double pay. Surrounding Sydney : the Blue Mountains with their dark Rain Forests, their huge tree trunks, gigantic ferns, rocks, waterfalls and the incredible variety of birds mixing all their songs. How fascinating and impressive are the skies! 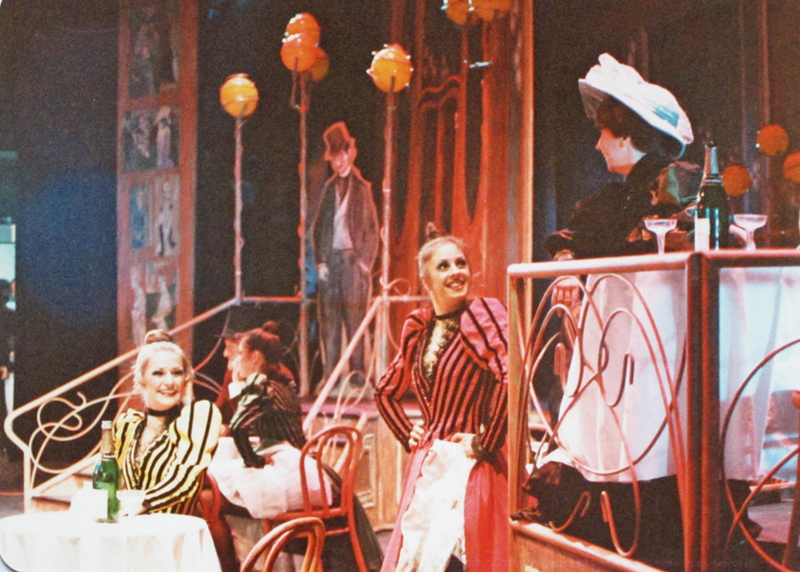 In the Moulin Rouge scene some dancers dance the French Can-Can, the others seat at tables representing an audience. But the dancers, one after the other, catch the flu and, for a few days, there is no more enough dancers in good health : they all are in the Can-Can and nearly nobody is sitting. The artistic director comes to Michelle asking her if she would exceptionally agree to wear a costume and sit on stage as a member of the audience in the Moulin Rouge scene. Michelle loves that. 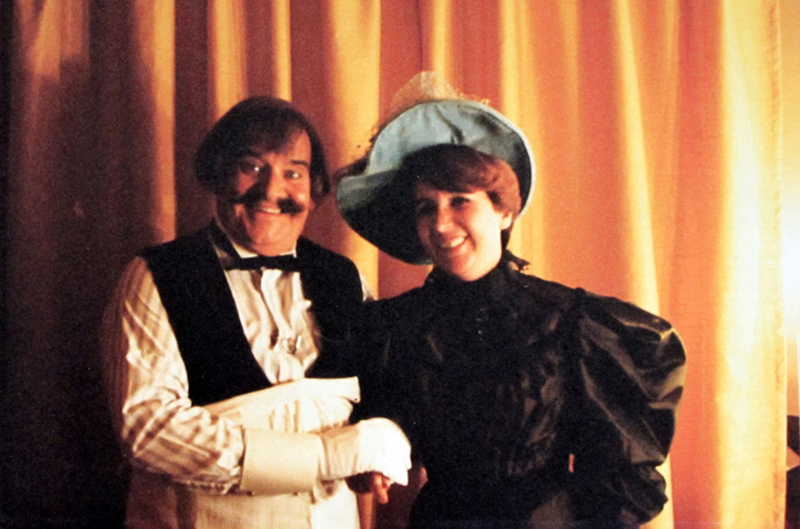 Ronnie Barker plays the Moulin Rouge’s director and he comes to Michelle’s table to clink glasses. He jokes and even say to the audience : “Tonight we have Michelle”. Right after the scene, at the interval, he absolutely wants to have a picture with her. We have one week off during the Sydney season. We fly to the Pacific Ocean shores, up north, to sunny Cairns, on the Great Barrier Reef. We spend 3 hours in the plane. We notice down below a small town. The plane turns around it, reduces its speed and approaches to what seems to be a small landing ground : we cannot believe it. Any problem? Not at all. We reach our destination. Hot weather. We only see 4 employees, with long shorts, high socks and safari hats. The suitcases arrive on a few trolleys and everyone is taking their belongings off them. We have rented a car : the road is empty, then we see a few isolated houses and finally we reach the town : low wooden houses, posts to hold canopies. It is Sunday around noon, all the shops are closed, the streets are deserted and dusty. At every street corner, a Far West horse rider is expected to emerge. We feel like being in a western movie. Dream week : we have a huge beach just for us. Austral winter, 27° Celsius. The Great Barrier Reef : excursion on a glass bottom boat and we go down into an underwater observatory from where we watch sea turtles, sharks, multicoloured fishes and corals. Hinterland : endless gum tree forests on the heights of the Australian Cordillera or a lookout onto the plains and the Ocean. Before the twilight, we see fires light by men in order to fertilise the ground. They set ablaze the sugar cane fields : the orange-coloured fires and the red glow at sunset meet in an infinite where earth and sky merge. Silence, serenity and harmony : even our childhood dreams would never have imagined such a communion with a country both so old and so young. P.S. 2016 : since years, Cairns has totally changed. It is nowadays a real touristic city with modern buildings for very organized holidays. Omar Pasha’s act is about the best magic turn in the world.